The driver took us a short way along this narrow peninsula that is Placencia, through the heavy, expertly carved, gigantic wooden gates and into this eye-popping lush tropical paradise. We had arrived at Chabil Mar. The first thing I noticed was the verdant, tropical landscaping, flowers, shrubs, trees everywhere, and the ever present coconut palms lining the pristine, white sand beach. The next was the friendliness of the staff, including the driver that picked us up and took us there. We were handed a cool, tropical drink and escorted to our villa by the friendly concierge, while all the way she was cheerfully explaining the ins and outs of the resort. One interesting fact was that there was no dining room. Eating was wherever you wanted—in your villa, on your deck/balcony, by the pool, near the bar in the charming palapa, with comfortable seating and a soothing sheet pratfall separating the space from the bar, on the wonderful dining deck overlooking the beautiful Caribbean—wherever you wanted. And, what we found was that usually one of the staff would find you around mealtime and ask where you wanted to eat. By the way, the food was excellent. When we arrived at our villa, a spacious and luxurious, accommodation, we found that, being valentine’s day, the staff had made the most elegant and exotic floral arrangement I’ve ever seen visiting these luxury resorts. It was replete with the customary swans, a giant heart with “BE MY VALENTINE” written in flowers—bougainvilleas, hibiscus, and other flowers. And, as we entered the front door, a path of bougainvillea petals had been strewn all the way to the bedroom with this fantastic arrangement covering the bed. Our villa was tastefully decorated (all were decorated differently), with an ample, comfortable living room, dining for six (if you wanted the crowd) and a full kitchen with all modern appliances. The bedroom was also ample with its own balcony. The bath was beautifully appointed and next to it was a small room with a washer/dryer. You could live here indefinitely. On the bar, separating the kitchen and the living area, we found the daily Chabil Mar newspaper announcing the valentine’s day dinner and activities, welcoming us and other arriving guests by name. As we were finishing our welcome drinks at the umbrella table on our private deck, one of the amiable staff (as they all were) came by and asked us if we needed anything and if we knew where we wanted to eat lunch. We opted to eat right there, on the deck, surrounded by the profusion of blooming flowers. Chabil Mar is an exclusive, small, boutique luxury resort with 22 lovely villas, two swimming pools, a newly expanded palapa (thatched roof) bar, a pier leading to another palapa over the waters of the Caribbean with seating, tables for dining and just a very tranquil spot to hang out and look at the beach or the stars. All this, along with the best stretch of white sand beach around, make this spot the penultimate in barefoot luxury. Many of Chabil Mar’s guests have the resort arrange one or more of the exciting trips offered–visiting the world’s second largest barrier reef, sailing, diving, fishing (the chef will prepare a meal from your catch for you), or visiting ancient Mayan ruins, or the jaguar preserve, and many more. We opted for a little beach time and an occasional trip into town to look around or dine at one of the fine restaurants. 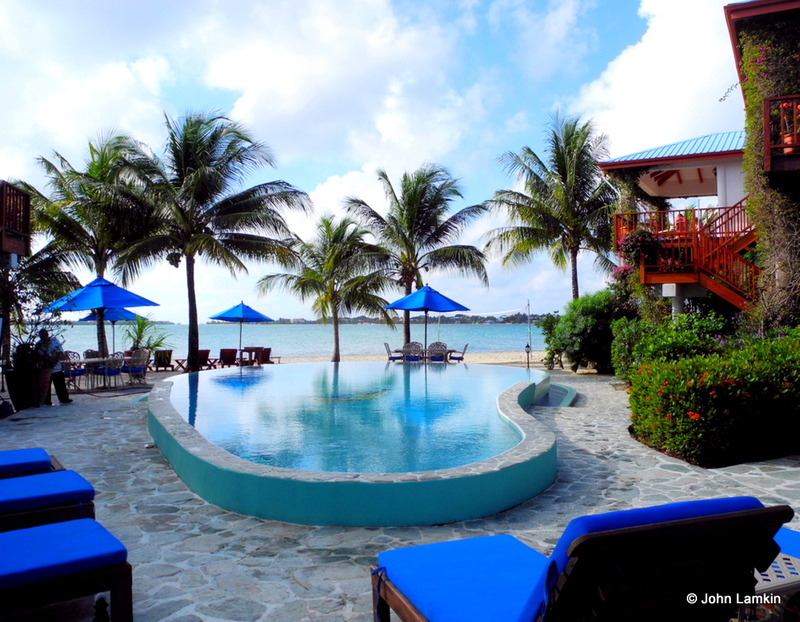 Chabil Mar is ideally situated between the Tropic Air terminal (which services many destinations in Belize as well as Roatan, Honduras and Cancun, Mexico) and the small town of Placencia–a short taxi or bicycle ride away (the resort provides bicycles). English is the language of the country, making it an easy choice for people traveling from the United States and Canada, but it attracts Europeans as well who are looking for unspoiled tropical destinations to discover. It’s less than half an hour by small plane from Belize City and there are frequent flights both in and out of Placencia, a place formally thought to be very difficult to get to. Whether looking for a quiet, laid back beach holiday or an exciting, active visit, both can be found at this lovely tropical paradise. Both United and American Airways have flights from the U.S. to Belize City, Belize. Placencia is serviced by Tropic Air. All content is © 2009-2017 by John Lamkin. All rights reserved.